…yeah, yeah, whatever. Look, Peter Quill is back as Starlord, and the first lineup of the modern day Guardians of the Galaxy (even though they don’t technically call themselves that, it’s basically the beginning of the modern team) has been formed. Let’s take a quick look at some of the new members. 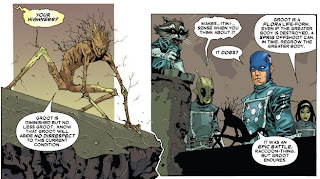 Groot - Created by Stan Lee and Jack Kirby, Groot first appeared all the way back in TALES TO ASTONISH #13, which predates the modern Marvel universe. As part of the monster book of the month era of comic books, his original appearance was as an invader intending to kidnap humans for experimentation, billed as the Monarch of Planet X. 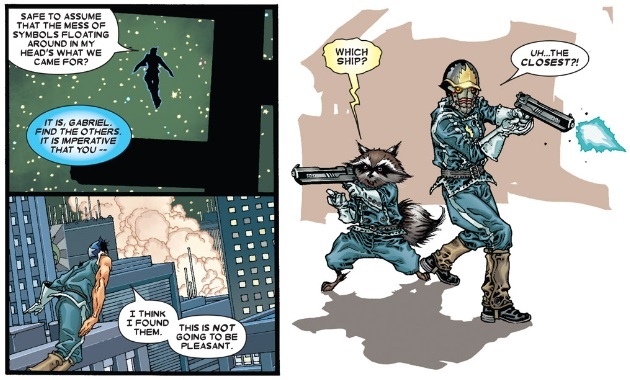 He made a few small appearances here and there throughout the years, but nothing of significance until this Starlord mini-series. 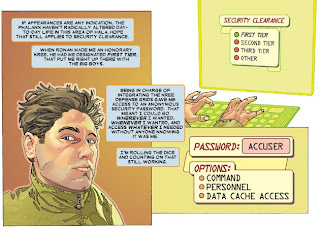 He is probably the single-most obscure character resurrected and re-imagined for these comics. 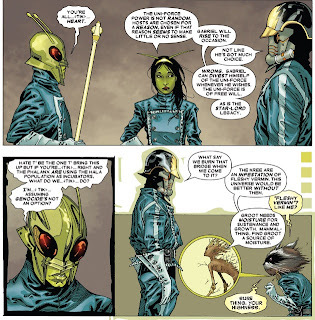 Mantis – Created by Steve Englehart and Don Heck, Mantis first appeared in Avengers #112. Half-Vietnamese and half-German, she was left as a child at a temple for the Priests of Pama. As part of the classic “Celestial Madonna” storyline in Avengers, the Kree believe she was destined to become the mother of the Celestial Messiah. 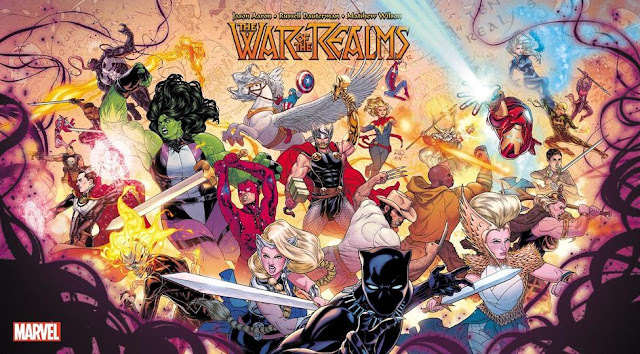 She has many adventures with the Avengers until, long story short, she marries a Cotati in the reanimated body of her former suitor, the Swordsman, and leaves the Earth to mate with him. Her subsequent appearances throughout the years are so inconsistent, that the different versions of her character actually became part of the stories. In the first issue of the Starlord mini-series, Giffen seems to possibly explain away the previous history of the character as a delusion. Bug – Created by Bill Mantlo and Michael Golden as a part of the legendary Micronauts team and comic book. See previous Back Issue Ben retrospectives for more information. 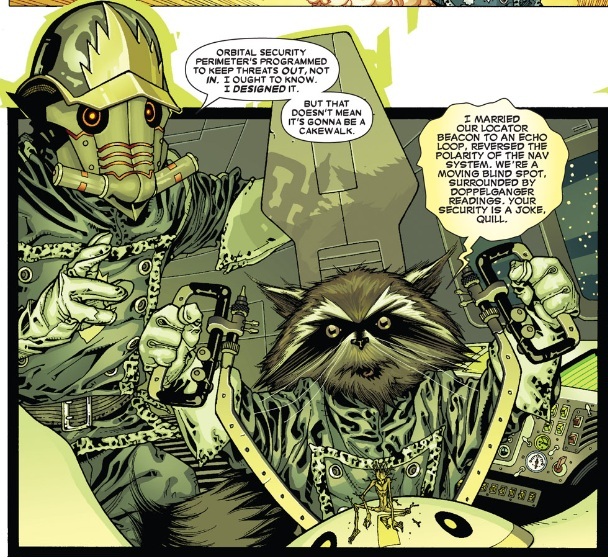 Rocket Raccoon – Created by Bill Mantlo (there’s that name again) and Keith Giffen, Rocket Raccoon first appeared in a back-up story in Marvel Preview #7. In 1985, he received his own limited series written by Mantlo and penciled by future superstar Mike Mignola (creator of Hellboy). 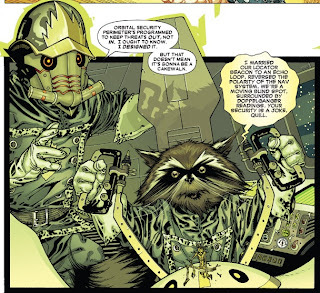 Rocket comes from the planet Halfworld, where he is known as the “Guardian of the Keystone Quadrant.” Halfworld is an abandoned colony for the mentally ill, where the animals have been genetically manipulated to have anthropomorphized bodies and human-levels of intelligence. The animals act as caretakers of the inmates. 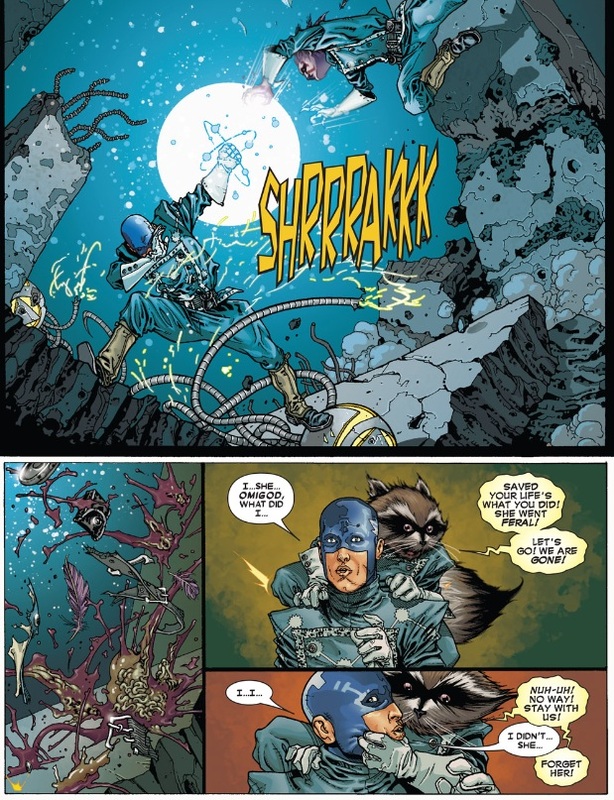 Rocket had many adventures while living on Halfworld (including one with the Hulk) before he and the other animals eventually took off into space to have their own adventures. Captain Universe – Created by Bill Mantlo and Michael Golden, the Uni-Power is a cosmic force that attaches itself to a host in a time of crisis, transforming that host into Captain Universe. (Again, see the Micronauts retrospectives for more information.) This is the first appearance of Gabriel as Captain Universe. So now that we’re all caught up, let’s get on with the rest of the series. Starlord and his team have made it into Hala, and immediately come under fire from Phalanx sentries. Starlord orders Captain Universe Gabriel to use the Uni-Force to clear them a path through the attacking sentries. Deathcry is enjoying the scrap a little too much, and gets very upset when Gabriel takes out a sentry that she had targeted herself. The team heads into the underground levels, to try and locate the replication plant that is creating the viral bombs. Since they are not using any technology, and the uniforms they are wearing dampen their heat signatures, they should be virtually invisible to Phalanx detection. Deathcry complains to Starlord about Gabriel robbing her of a kill. 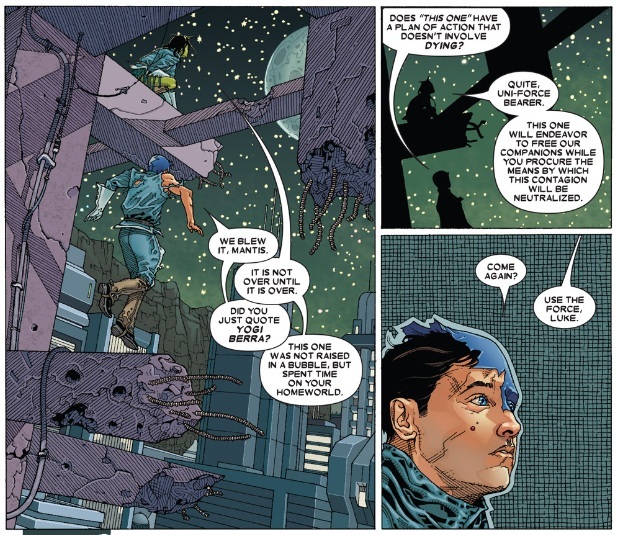 Mantis interjects that this is a grave offense in Shi’ar culture. Starlord reviews the map of the sub-levels with Bug, but there is no indication of where the replication plant might be. In the Phalanx nerve center, the Phalanx analyze the data from when Starlord and his team first dropped in. The determination is made that they are of little threat unless they try to use technology, in which case they will be at their mercy. 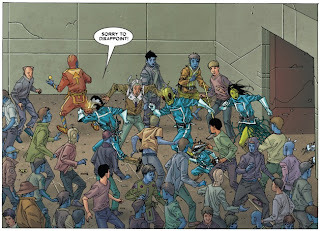 At that same moment, another intrusion is detected from the planet Kree-Lar. Back in the sub-levels, Starlord and his team continue their search. Mantis suggests that maybe the Phalanx are utilizing micro-miniaturization. The ceiling explodes, revealing the intruders detected by the Phalanx just a little bit earlier. They are former Annihilation Wave bugs currently operating under the command of Ravenous, locked in battle with Phalanx sentries. Starlord holds his team back, out of the line of fire, but Deathcry goes jumping into the fray. Now with no choice but to engage, Starlord and his team join the battle. The bugs attempt to help, but their weapons keep getting shut down by the sentries. Starlord finds a drainage pipe for them to escape through, and calls for the team to retreat. 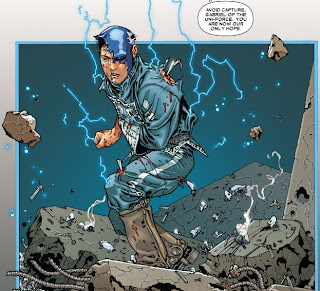 Captain Universe Gabriel and Deathcry are the last two out on the battlefield. 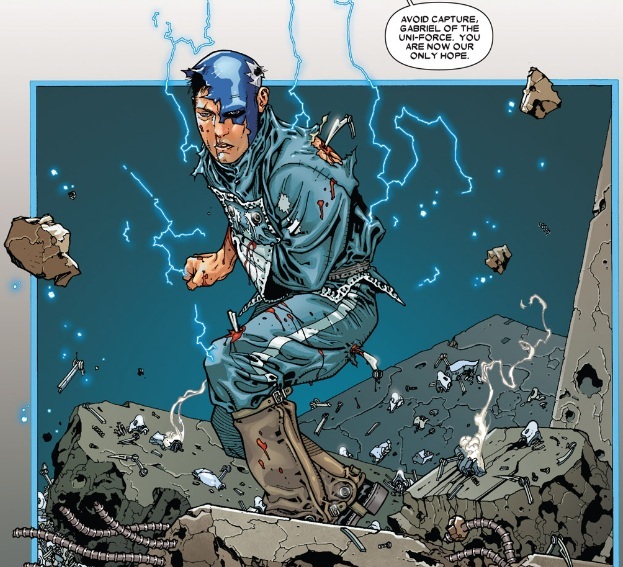 He again reflexively saves her from a sentry, sending her into a rage, and she lunges at him. He instinctively protects himself with the Uni-Power, causing her to explode in a mess of blood and guts. Gabriel starts to lose it, and Rocket comes to pull him out. The team escapes through the pipe, while a too large to fit Groot stays behind to hold off the sentries (much to Rocket’s dismay). 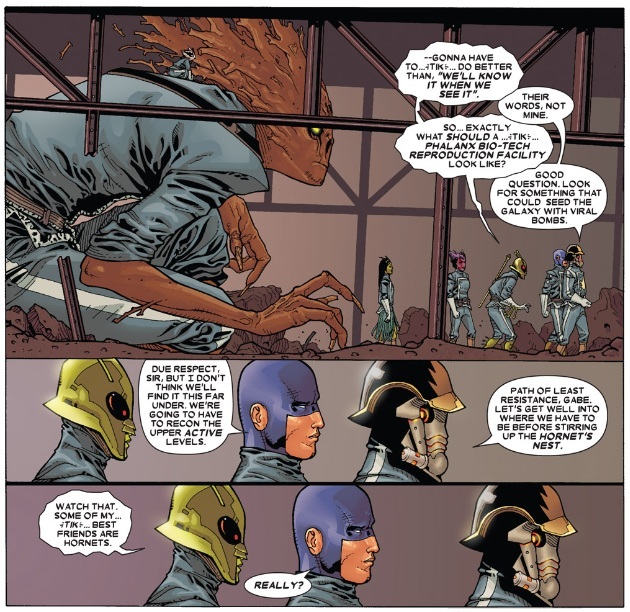 Starlord coldly tries to talk down Gabriel about killing Deathcry, leaving the rest to wonder how expendable he considers them all to be. My brain thoughts: The story is a pretty standard action plot, but what sets it apart from everything else is the interaction between the characters. The banter back and forth, the hilarious dialogue, that’s what makes me such a big fan of this team, and it’s not even at full strength yet. The art by Green II is the best out of all of the lead-in series, with it being fairly detailed in parts (he’s really good at drawing expended rounds from guns). Two members of the team have already bought it (poor Groot), who’s going to be next? Two days later, Starlord has gone undercover out amongst the general population. He’s decided to find a computer access console and test if his anonymous security password still works. 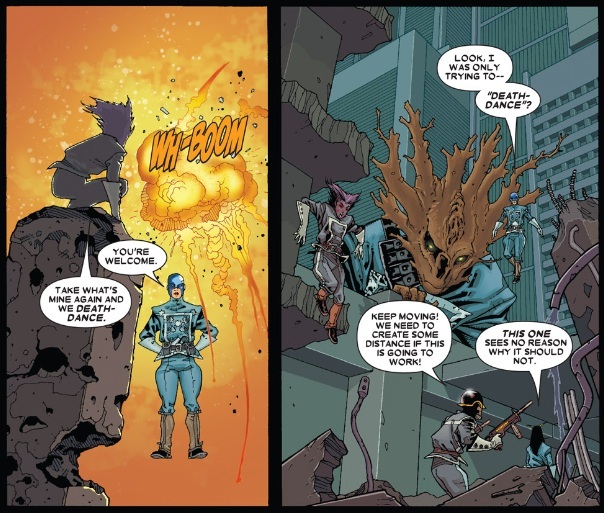 He discovers that the viral bomb has already been deployed, in the form of an airborne nanovirus. The entire population of Hala has already been infected and they don’t even know it. Down in the sub-levels, the rest of the team waits for him to return. 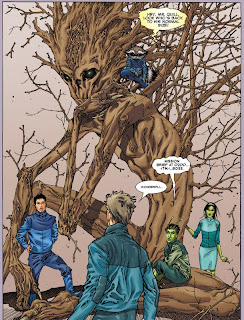 To their surprise, a miniature Groot (grown from a single sprig of the original) shows up, much to Rocket’s delight. Starlord returns to give them the updated info. 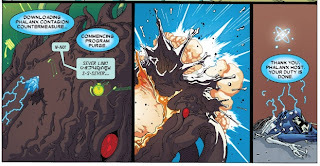 Captain Universe Gabriel is still shell-shocked about killing Deathcry. Mantis is certain that he will rise to the occasion, since the Uni-Power always picks its host for a reason. Groot’s dialogue is so hilarious. They retreat while Captain Universe Gabriel finally snaps into action and tries to hold the mousers off. They keep retreating further and further, each team member trying different delaying tactics so that they can get away. Finally arriving at a long access tunnel to the surface, the rest of the team begins to climb while Gabriel stays behind to delay the robots, and then blow the tube housing of the tunnel. As he fights, the Uni-Power tells Gabriel that it detects a techno-organic anomaly within his system. He has possibly been infected by the airborne nano-virus, and so have the others. The others make it up and out into the regular population, flushed out of hiding just like the Phalanx had intended. They are surrounded by sentries. 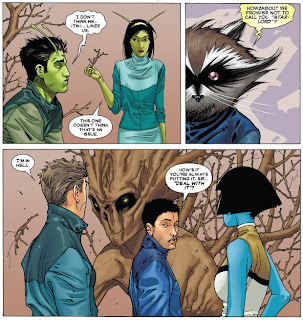 Mantis makes herself invisible to their detection and slowly moves away while Rocket, Groot, Bug, and Starlord are taken into custody. Only she and a still surviving Gabriel are left to finish the mission. 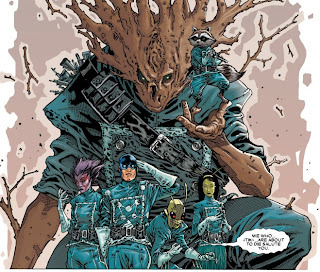 My brain thoughts: Groot is still alive, fooled you! You were worried for a second there weren’t you? Or maybe not. 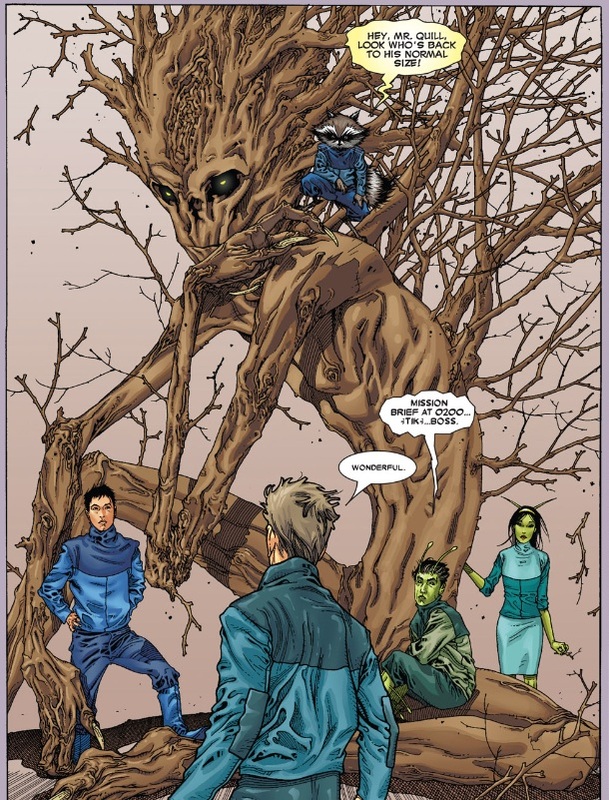 It’s weird to see Groot actually talk in full sentences (you’ll know what I mean by that later on). It’s weird, but delightful. Nothing makes me giggle more than an alien species referring to humans as “fleshy ones” or any variation thereof. (Megatron from the classic Transformers cartoon is another example that springs to mind.) 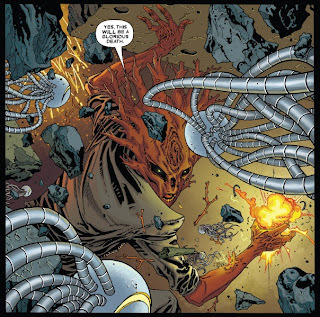 There seems to be another possible slight disconnect between this series and the rest of the tie-ins, with the general population of the Kree seemingly not under mind-control from the Phalanx. Again, not really an inconsistency, as you could explain it as the Phalanx focusing only on the leadership and army of the Kree, leaving the people to go about their days. Still seems a little bit off though, as I think they would want to just pull them all into the hive-mind. 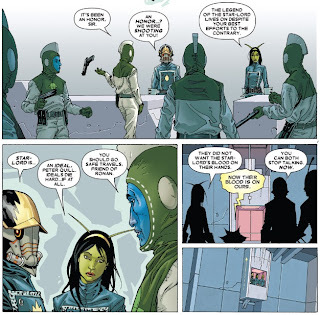 Starlord, Groot, Bug, and Rocket are detained in a Kree penal unit, wondering why they haven’t been assimilated yet. Across the city, Mantis and Gabriel regroup. Mantis believes that the team will be kept alive, so that the Phalanx can study the efficiency of the contagion on a diverse group of biological hosts. The Uni-Power addresses Gabriel again, suggesting that the Phalanx would not deploy a weapon without considering all the possible outcomes, indicating that there may be an antidote. In the Phalanx nerve center, two Phalanx research units confirm that they have been studying the effects of the nano-virus on the team. Their research completed, the team is now expendable. Suddenly, one of the units begins to glow and surge with energy, revealing itself as a bearer of the Uni-Force. 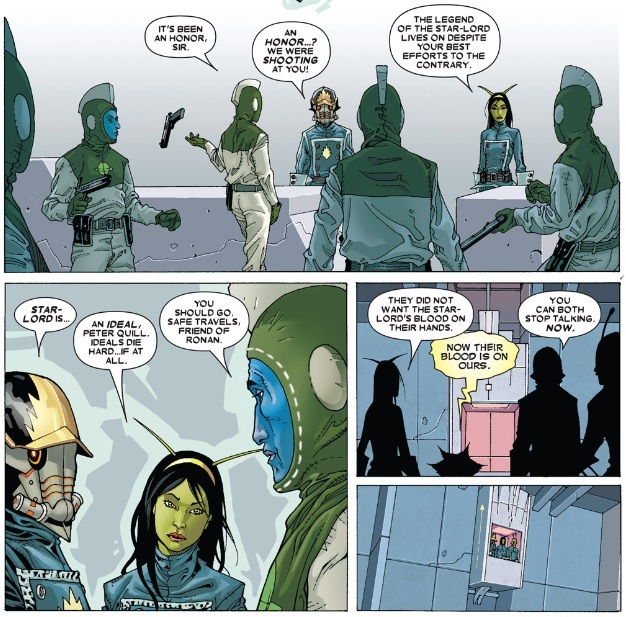 Mantis breaks into the detention unit to free the rest of the team, and updates them on their plan to give the Uni-Force to the Phalanx. She believes it will be able to pluck the contagion cure from the Phalanx mainframe, and then return to Gabriel. 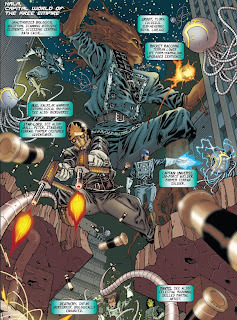 The rest of the Phalanx present try to terminate the Uni-Force empowered Phalanx, but it believes that it can control the Force, and discover the secret of its power for the Phalanx to utilize for their cause. The team attempts to escape, but are under fire from Kree soldiers (under orders from the Phalanx). When Groot gets hit by a blast, they realize the Kree soldiers are firing on stun. 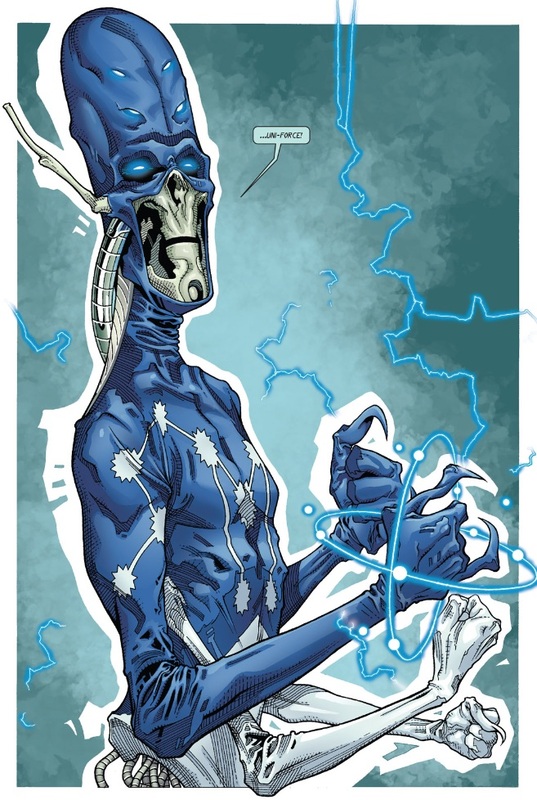 Ceasing hostilities, they learn that the Kree are honor bound to obey commands, but only when it’s for the furtherance of the Kree. Since their orders are coming from the Phalanx, they obeyed by firing at the team, but not lethally (their method of defiance). 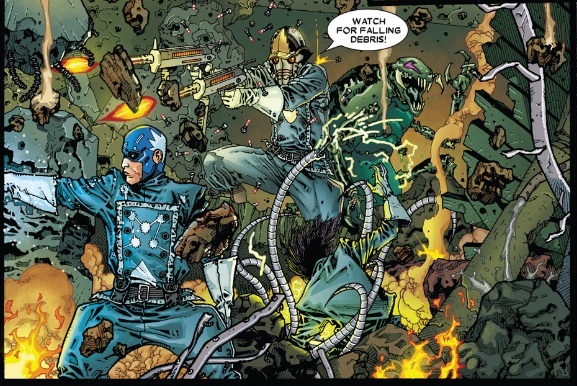 The Kree unit stands down, letting Starlord and his team pass. 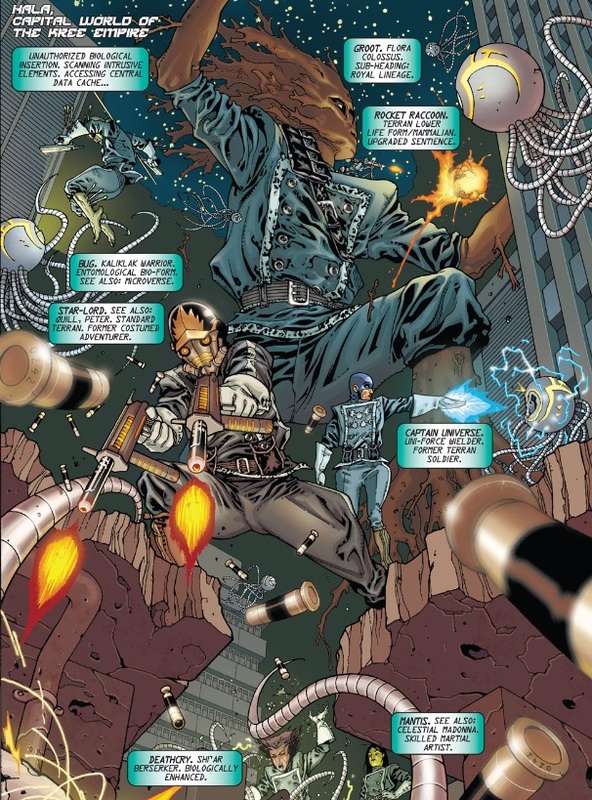 The Uni-Force infiltrates the Kree mainframe, downloads the contagion countermeasure, destroys the hosting Phalanx unit, and returns to Gabriel just in time to save him from attacking sentries. He joins the rest of the team in the process of commandeering a ship to escape. They are chased out into space. They make it to the agreed-upon extraction coordinates, and are teleported away before the ship is destroyed by Phalanx forces. The members of the team have earned their pardons. 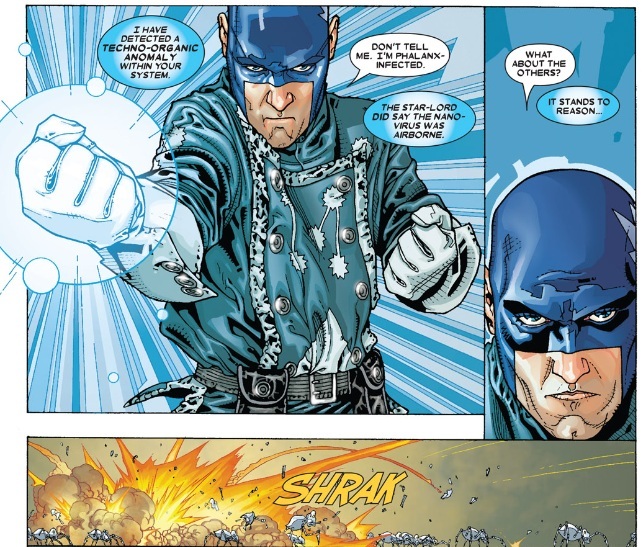 The Kree medics are preparing an airborne antidote for the remaining citizens of Hala. Gabriel is the recipient of some brand new legs, courtesy of the Kree. But the Uni-Power has moved on to its next host. He still wants to remain as a member of the team. Starlord is a little surprised to hear that there still is a team at all. Chan-Dar confirms that the team has not been decommissioned, and that leadership has been discussing new missions. Starlord doesn’t seem too happy about the idea (but deep down I’m pretty sure he’s enjoying himself). The team waits, ready for its next mission. 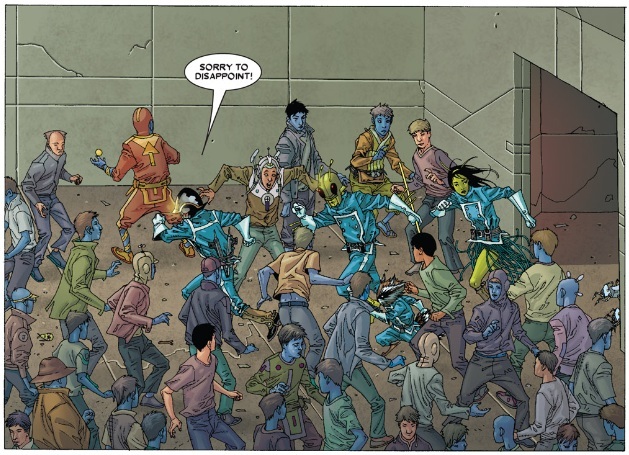 My brain thoughts: Still seems a little off that the Kree soldiers are not assimilated, and operating completely of their own accord, other than the orders from the Phalanx. But it’s only a minor observation. My final brain thoughts: Uppity tree people, talking raccoons, mousers, penal units, and the beginning of an era. The full glory of these comics may not fully come across in a beat-by-beat retrospective of the events. 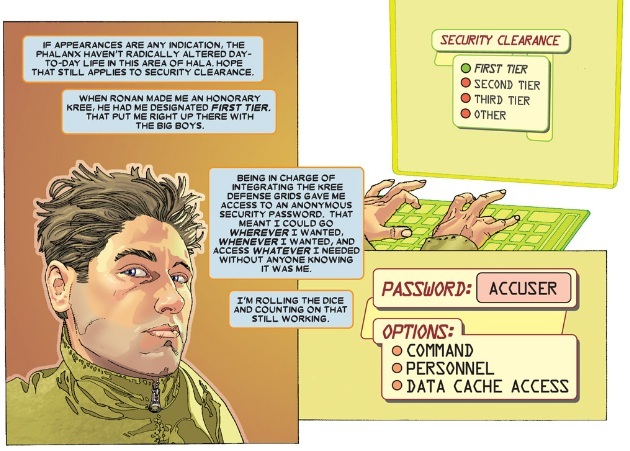 What makes this team and these comics so special is the interaction between the characters, and the humor. If the glory did come across at all, well, you haven’t seen anything yet. This was just the beginning, about 10% of the awesomeness that the team will be when they move into their own title. (I feel like I’m setting everyone’s expectations way too high, but oh well, I love these comics so much. Don’t look for objectivity here.) That’s still a little ways down the road though, there’s still a thing called Annihilation: Conquest to finish.